Are You Ready For ‘Dis? One fan showed up at 2 a.m. on Airline Drive so he could be first in line when the gates opened six or seven hours later, despite 100 degree heat in the offing. A new Saint, rookie cornerdat Patrick Robinson, swatted a pass away in his first practice and the crowd roared, enough to generate a news wire from WWL. In New Orleans, Saints Training Camp (“STC”) gets as much zeal in regional media coverage as a convention for a presidential election. Obviously, The Nation does not require heat to catch the fever. The fan was ready for ‘dis, and Robinson was ready for ‘dat. I am curious how ya’ll feel, because admittedly I’m not quite yet ready for ‘dis. I’ve been prone to late night reruns of the onsides kick in the Super Bowl. I still need to get a play-by-play DVD of the Vikings game, before the rematch in September’s opener. I’ve sinned in not yet reading Drew Brees’ book, but am breezing my way through Sean Payton’s candidly good tome, besides having another new book to be occupied with. And there is the matter of the yellowing sports sections from last January still pending completion, sitting under the coffee table (please don’t call the fire marshal). If this were, say, late October, and I was this “behind” with things, I’d be tempted to have my head shaved, and run off with the Hare Krishnas. 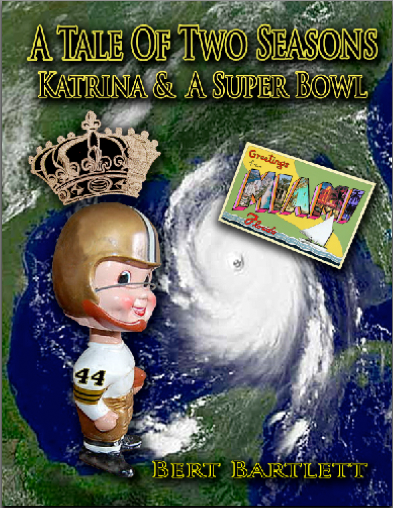 Thankfully, there is still ample time to get crunk for the Saints, 2010 edition, because August is pro ball’s annual Hot Air Month. It’s not that you can’t believe what you read in the papers during STC, it’s just that it really doesn’t matter – except for who got injured, and for how long. Player personnel and team spins will make themselves readily evident by December, on plenty of consecutive Sundays. It is highly unlikely any sports sections from this month will make its way to under my coffee table, more so to the fireplace when it gets cold enough, if I can secure the thing. The only people legitimately mesmerized with pre-season are participants in Fantasy Football leagues, who sharpen their pencils and do Machiavellian detective work on their competition and the players they may draft. At the moment, I’m not as concerned about Black & Gold, as I am Purple & Gold, as in Elle Es U (!). I’m not bashful about remaining in the corner of now semi-embattled head coach Les Miles. The guy could have gone off to Michigan and gotten anything he wanted after winning a national title, choosing instead to stay in Baton Rouge. Shouldn’t we stay with him? And last but certainly not least, I hope Metairie Park Country Day has a fulfilling season, for those players and their coaches who bust their butts in the heat sopping doldrums of August to make it so. Geaux Cajuns! Posted in Uncategorized.Tagged A Tale Of Two Seasons, Coming Back Stronger, Drew Brees, Home Team, Major College Football, Metairie Park Country Day, NCAA, Pre-Season, Sean Payton, Training Camp. Thanks for the mention. I sent it to my brother who just happns to coach football at CD. Also re: the Brees book signings, the two that I saw were an illegible number 9, no letters in sight. Aha! Number 9 instead of letters; the secret to one every two seconds. I’m gonna be honest Bert. The first blog you wrote, i guess last year had me scracthin my noggin for continuity and somewhat disappointed. “Dis” hit da spot!! The flow was real and the syntax was spot on. Very well written in dat vernacular but not over the top as to induce vomiting or main lining Ojen. GOOD JOB!!! Dats U!!! As far as I’m concerned, basically, the reader is always right. ‘Dis one appreciates ‘dose comments from ‘da press box.